What is the Post-2015 Agenda? The Post-2015 Development Agenda is a United Nations-led process to help define the future global development framework that will succeed the UN Millennium Development Goals (MDGs) and will follow up on the outcome of the Rio+20 Conference on Sustainable Development. In 2000, the UN Millennium Summit agreed on eight specific goals – the MDGs. These were aimed at reducing global poverty and saving lives and are set to expire in 2015. In 2012 the United Nations Conference on Sustainable Development (Rio+20) agreed to develop a set of Sustainable Development Goals (SDGs) to address the key challenges of sustainability, and prepare options for a sustainable development financing strategy. It was also decided at UN level that this will be the main basis for integrating the SDGs into the post-2015 agenda. In addition, in December 2014, the UN Secretary General published a Synthesis Report “The Road to Dignity by 2030: Ending Poverty, Transforming All Lives and Protecting the Planet”. The wide consultations with stakeholders and intergovernmental negotiations that have taken place to date will culminate in a special Summit on sustainable development at the United Nations in September 2015, where world leaders will be asked to agree the new agenda, including a set of Sustainable Development Goals. Prior to the September Summit in New York, the international community will gather for the third International Conference on Financing for Development in Addis Ababa, in July 2015. The Conference is expected to lay out how the newly proposed post-2015 framework could be implemented through both financial and non-financial “means of implementation”. This reflects the fact that in order to successfully put the post-2015 framework into practice, it will need both the right policies and adequate financial means at a number of different levels. Agreement on the post-2015 agenda will also have important implications for negotiations for the 21st Conference of the Parties (COP21) of the UN Framework Convention on Climate Change in Paris in December. What are the key elements of a Global Partnership for Poverty Eradication and Sustainable Development after 2015? An enabling and conducive policy environment: Both internationally, and in individual countries, a coherent mix of effective policies, practices, institutions and resources is needed to create the right conditions for implementing the post-2015 agenda. This includes legal frameworks and economic instruments and incentives. Good governance at all levels is also an essential objective in itself. Develop capacity to deliver the agenda: The post-2015 agenda can only be successful if all partners have effective institutions and the necessary human skills and capacities to eradicate poverty and deliver sustainable development. This includes the capacity to assess needs, collect data, monitor implementation and review strategies. Mobilisation and effective use of domestic public finance: National governments have the main responsibility for carrying out sustainable economic policies. This includes the responsibility to mobilise and use public resources, including natural resources, efficiently and sustainably. Mobilisation and effective use of international public finance: International public financing continues to be an important and catalytic part of the overall financing available for developing countries. All countries have a role to play in mobilising financial resources. The European Commission strongly supports the UN Secretary General's call that developed countries – including the EU – should meet the UN target of 0.7% Gross National Income (GNI) target for Official Development Assistance (ODA). The Commission also supports the idea that upper middle-income countries and emerging economies should equally commit to increasing their contribution to international public financing, and should set out specific targets and timelines for doing so. Stimulate trade to eradicate poverty and promote sustainable development: Trade is a key factor for sustainable inclusive growth and sustainable development. The EU remains fully committed to the Doha Development Agenda of the World Trade Organisation and the implementation of the Bali package. This includes notably the Trade Facilitation Agreement and the elements related to the Least Developed Countries which promote further integration of these countries into international markets and sustainability through a range of trade agreements. Drive transformative change through science, technology and innovation: Science, technology and innovation, including digitisation, can generate profound changes in a relatively short period of time. However, these changes might not automatically address social and environmental problems. All stakeholders have to exploit the potential offered by science, technology and innovation to benefit smart, sustainable and inclusive development. Mobilising the domestic and international private sector: Business and consumers have a key role to play in achieving sustainable development. The private sector, ranging from small stakeholders to major multinationals, is an important engine for innovation, sustainable growth, job creation, trade, and poverty reduction. It also plays a critical role in investing in resource efficiency and infrastructure, such as sustainable transport systems, energy networks and digital infrastructures that are vital for a country's economic growth. Harnessing the positive effects of migration: For individuals, migration can be one of the most powerful and immediate strategies for poverty reduction. People move to escape poverty and conflict, adapt to climate change, environmental and economic shocks, seek protection from persecution or serious harm, and improve the income, health, and education of their families. Monitoring, accountability and review: The monitoring, accountability and review framework for the SDGs should be an integral part of the agenda and be underpinned by the principles of transparency, inclusiveness and responsiveness, efficiency and effectiveness. It needs to cover all aspects of the SDGs as well as all means of implementation, including all aspects of financing.The UN's High Level Political Forum on Sustainable Development is the primary forum in this context and has a key oversight role for maintaining political commitment and facilitating a review of progress and best practices, including recommendations for further action at national or international level. 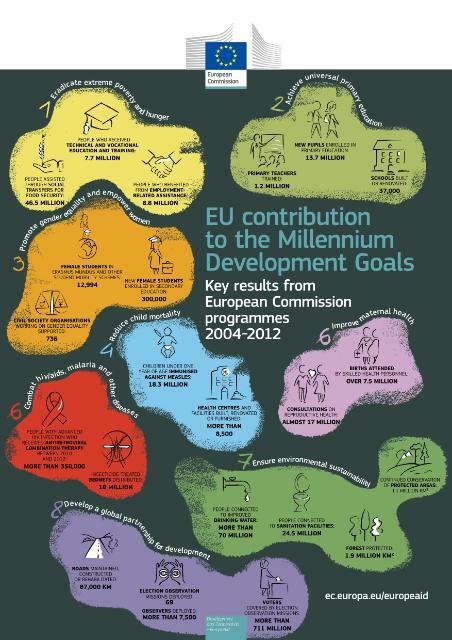 How does the EU contribute to preparing the post-2015 agenda? The EU is playing an active role in preparing the post-2015 agenda by expressing its views in a number of key documents from 2013 up to now. These documents serve as a basis for discussion and negotiation with our international partners. Today’s Communication from the Commission is expected to lead to Conclusions from the Council in spring 2015. The Communication builds on a series of earlier EU contributions to the post-2015 process. The European Commission issued a first Communication “A Decent Life for All: ending poverty and giving the world a sustainable future” in February 2013, followed by Council Conclusions on “An overarching post-2015 framework” in June 2013. These set out an ambitious vision for a universal agenda for both poverty eradication and sustainable development, addressing priority elements including (i) decent living standards; (ii) drivers for inclusive and sustainable growth; (iii) sustainable management of natural resources; (iv) equality, equity and justice; and (v) peace and security. A second Communication “A decent life for all: from vision to collective action” was issued in June 2014, followed by Council Conclusions on “A transformative post-2015 agenda” in December 2014. The Conclusions provided a more detailed EU vision for the post-2015 agenda, including on principles, areas to be addressed, the new global partnership for implementing the agenda, and on follow-up and review.